25 Strategies for Community College Leaders and Innovators. Student Success Collaborative. EAB (Education Advisory Board). 2016. Chronicle of Higher Education. Includes links to other resources. Keynote Address by Dr. Davis Jenkins, Community College Research Center, and a downloadable .ppt presentation, "Redesigning College for Student Success." Game Changer Series. Completion by Design. Citation: Dadgar, M., Venezia, A., Nodine, T., & Bracco, K. R. (2013). Providing structured pathways to guide students toward completion. San Francisco: WestEd. 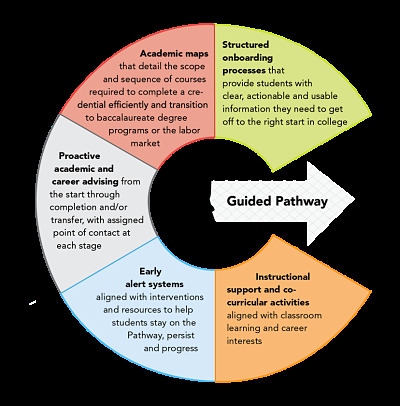 Increasingly, colleges and universities across the country are adopting “guided pathways” reforms to create clearly defined, educationally coherent pathways into and through programs of study for their students. Facilitated by built-in supports, the goal of guided pathways is to increase learning and graduation rates, and to help more students complete programs that lead to career advancement and further education as efficiently as possible. The author of this brief examines data from 48 interviews with first-year students at City Colleges of Chicago (CCC)—a large urban community college system with seven campuses that since 2010 has been implementing guided pathways—to understand students’ reactions to CCC’s ambitious, system-wide reform. A large majority of the students were enthusiastic about program maps and educational planning—hallmarks of the guided pathways approach—yet a few students had negative reactions to these very same elements of the reform. And nearly half the students reported that they experienced problems with activities such as registration and course planning while new systems and practices were being deployed by the college, pointing to substantial implementation challenges. Presentation Materials. Washington's Guided Pathways Initiative, funded by College Spark Washington, aims to simplify the number of choices a student must make from college entrance to program selection to degree completion. 5 ways to boost community college completion rates: Policy Recommendations from Brookings report above. Abstract: This report describes how Ohio’s two-year colleges are approaching guided pathways reforms, based on on-site interviews with faculty, administrators, staff, and students at six selected community colleges and telephone interviews with representatives from all 23 Ohio community colleges. In these interviews participants were asked to describe their college’s progress in the four main areas of practice in the guided pathways model: mapping pathways to student end goals, helping students choose and enter a program pathway, keeping students on path, and ensuring that students are learning. For each area of practice, the authors highlight innovations the colleges have implemented that can serve as building blocks as they continue to implement guided pathways reforms more broadly. The report includes recommendations for the Ohio colleges as they build on and better align these innovations in ways that help students choose, enter, and complete programs of study that are designed to prepare them to succeed in employment and further education. The report concludes with a brief description of the next phase of research with Ohio partners. EAB's latest research to help more students enroll, persist, and succeed. In this publication of EAB blogs and insights, EAB experts share best practices to reduce jargon during onboarding, engage students in financial literacy training, and reimagine the traditional academic calendar to encourage reenrollment—to name just a few. Click on each category to explore expert insights in each topic area. You can either download the full publication or each article individually. "With generous funding from the Bill & Melinda Gates Foundation, the American Association of Community Colleges (AACC) recently launched a national project focused on building capacity for community colleges to design and implement structured academic and career pathways at scale, for all of their students. Building on emerging research and experience in the field, the project reflects AACC's commitments to follow through on recommendations set forth in the 2012 report of the 21st Century Commission on the Future of Community Colleges, Reclaiming the American Dream, and the 2014 implementation guide, Empowering Community Colleges to Build the Nation’s Future." Simplify students’ choices with default program maps — metamajors — developed by faculty and advisors that show students a clear pathway to completion or transfer, further education and employment in fields of importance to the region. Redesign intake, orientation, placement, and advising to help entering students choose a metamajor and enroll in a Program of Study as quickly as possible. Redesign traditional remediation as an “on-ramp” to a program of study, which helps students explore academic and career options from the beginning of their college experience, aligns math and other foundation skills coursework with a student’s program of study, and integrates and contextualizes instruction to build academic and non-academic foundation skills throughout the college-level curriculum, particularly in program “gateway” courses. Provide accelerated remediation to help very poorly prepared students succeed in college-level courses as soon as possible. Support students through a strong advising process, embedded and ongoing in the pathway experience and supported by appropriate technology, to help students make informed choices, strengthen clarity about transfer and career opportunities at the end of their chosen college path, ensure they develop an academic plan with predictable schedules, monitor their progress, and intervene when they go off track. Embed academic and non-academic supports throughout students’ programs to promote student learning and persistence. Redesigning America's Community Colleges: A clearer path to student success. by Thomas R. Bailey, Shanna Smith Jaggars, Davis Jenkins. Publication Date: (2015). Harvard University Press. Inside Higher Ed. Ashley A. Smith. April 2, 2015. Thomas Bailey. Opening Session, recorded. Making College Work: Pathways to Success Beyond High School by Harry J. Holzer and Sandy Baum. The infographic depicts the three pathways established by the State of Missouri and the STLCC course descriptions for these college-level math courses. Additionally, the graphic depicts how the concept of the pathways works with specific disciplines using implementation data from other states. The Missouri Department of Higher Education has not yet completed its work with four-year institutions to develop the list of meta-majors (over-arching disciplines) that will be aligned with each course. Once that information is available, the graphic will be changed to reflect that information. Implementation of these pathways began in fall 2018. Inside Higher Ed. Mike Rose, June 23, 2016. This is an essay on the challenges of guided pathways and possible unintended consequences such a restructuring could trigger.